I've learned several things as a result of purchasing this product: (1) I missed my true calling in life as a bartender. (2) When they say "bitter," believe it. (3) It's nearly impossible to squeeze 1oz of juice from the average lime with your hands. (4) If Trader Joe's wants you to pay upwards of $15 for something, there's a reason for the premium. We made all three drinks described on the packaging: Joe's Whiskey Sour, The New Daiquiri, and the Citrus Grove Gin Rickey. To be honest, I've never had a whiskey sour or a gin rickey ever before in my life. And the daiquiri in this case was nothing like the strawberry daiquiris I've tasted. Yes, I know. Haha. I've only tried the girliest drink out of the three. To be fair, though, I don't think I've ever actually ordered my own daiquiri. I've simply tasted my dates' daiquiris. Honestly. What? Don't believe me? Fine. And I also poured the bitters right onto my tongue. Guess what? They're bitter. And potent. They cost so much because they'll last you five years longer than it takes for the earth to crash into the sun...or until you decide to move out of your house and into a new dwelling for the fourth time in seven years and you pass the little bottles along to friends as part of your downsizing efforts. But who would do a crazy thing like that? The recipes call for five "dashes" of each bitter in its respective drink. How big is a "dash" exactly? I'm pretty sure that's not a universal unit of measure. But whatever. I think I erred on the side of "more than five dashes," because I genuinely appreciated the flavor they contributed, although I added a bit of extra syrup as well to balance out the bitterness. We used an agave syrup we had on hand rather than the called-for "simple syrup." I think I liked the whiskey sour the best, mainly because I love lemon. But the other two beverages were nothing to sneeze at. Sonia liked the rickey drink the best. It really did have a nice citrusy vibe, and the grapefruit bitter probably had the most interesting flavor in and of itself. We both enjoyed the daiquiri, but to me, the spicy bitter/white rum combo was the weakest of the three concoctions. 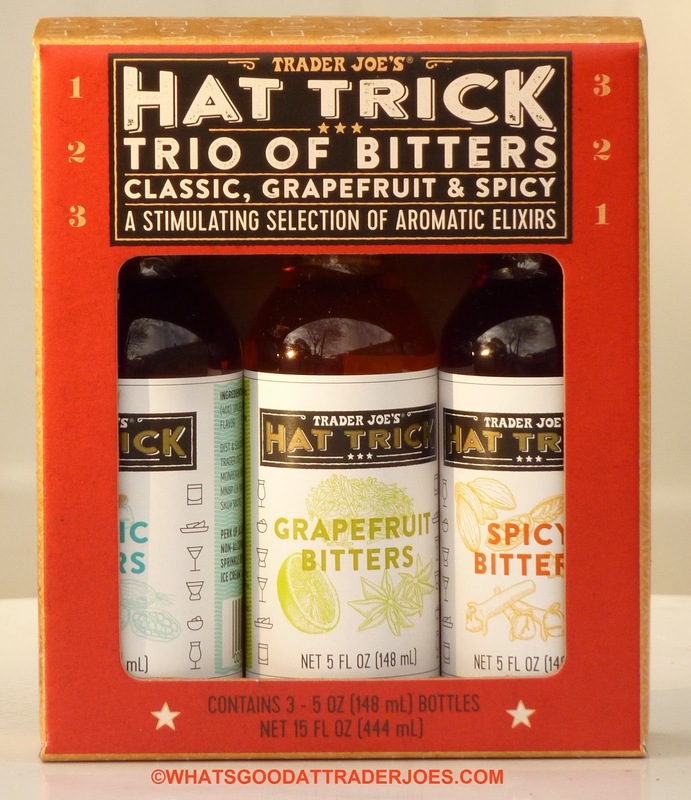 If you're not into the whole drinking scene, the package gives a few other suggestions for enjoying these bitters. It mentions using them on fruit or ice cream. I must admit, we did NOT try them that way, and we couldn't really see how that could possibly work. If you have tried the bitters that way, please let us know in the comments whether you liked it or not. 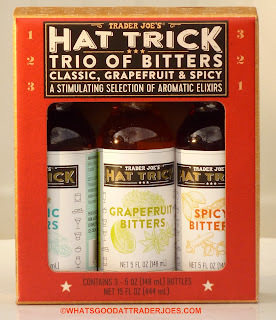 The box also mentions using the bitters in non-alcoholic beverages. That we did try. But after adding them to several different juices, fruit-infused sparkling waters, and sugar-free energy drinks (okay, that last one was just me) Sonia and I agreed that nothing worked quite as well as mixing them with good old-fashioned booze. Also, it's curious that they're 40% alcohol themselves. Yet they can be sold at TJ's that don't sell alcoholic beverages. I guess that's because nobody could ever drink enough of this stuff straight out of the bottle to get any kind of buzz without plastering a permanent pucker-face on his ugly mug. And in case some of you are wondering—no, I didn't try to do it myself. I only drank a dash or two straight from the bottle. I just look that way naturally. Anyway, score-wise, we know this product won't be for everybody. It's a relatively small amount of liquid for a relatively high price. But if you look up comparable gift packs of three bitters, most other brands will run you in the ballpark of $50 instead of $16. For that reason and for the quality of the product, I give it four and a half stars. Sonia will go with four. They CONTAIN a 40% alcohol, meaning their overall percentage is much lower. 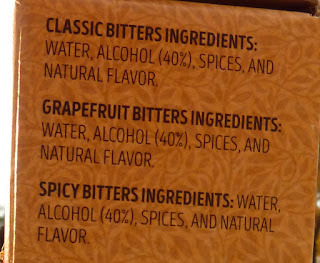 That doesn't mean that the bitters themselves are 40% alcoholic. Then what's the other 60% of the "alcohol" made of? 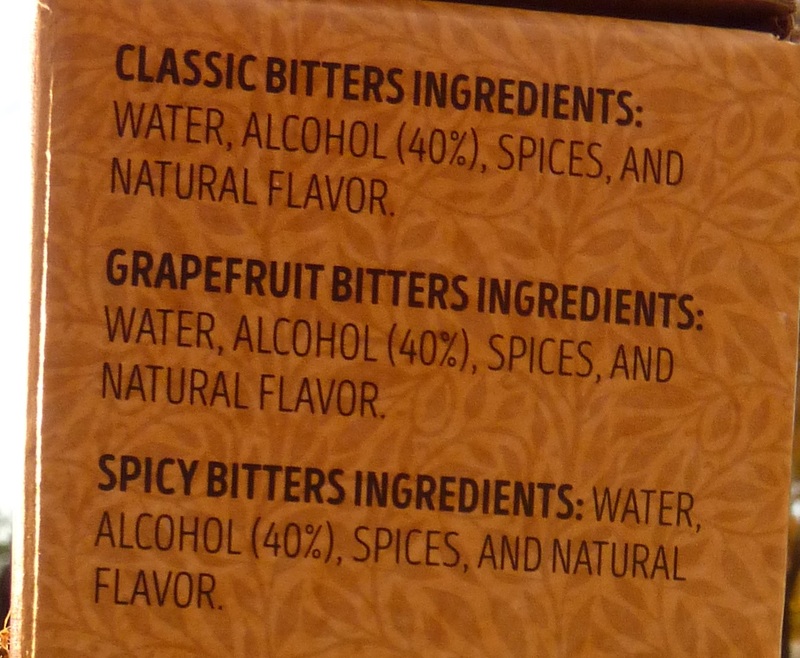 Nope, 40% of the bitters volume is pure alcohol (ethanol). They're 80 proof, if you keep track that way. I have no idea what Holly is trying to say here. They're 40% alcohol and available wherever the same way vanilla extract is. It's the same idea with a different set of spices. Basically, they have 20 proof alcohol in them, Nathan. It's probably mostly used as a preservative to keep the flavors clean and fresh. I haven't tried these but I have used other fruit-flavored bitters on fresh fruit. We made a simple syrup with lime bitters and drizzled it over strawberries this summer. The contrast was delicious, kind of in the same way as balsamic vinegar over berries. Thanks for letting us know about the bitters on fruit. That's fascinating. I'll have to try it next time. As for the alcohol content, 20 proof would mean 10% alcohol. 40% alcohol, as Mym said, would be 80 proof. Not a bitters maven but I generally have a few at home and use them. These are pretty darned good, and a good variety. (I used just one so far and tasted the other 2.) A great bargain for 3 5-oz bottles, btw.